The shoulder joint is formed at the junction of three bones: the collarbone (clavicle), the shoulder blade (scapula), and the arm bone (humerus). The scapula and clavicle form the socket of the joint, and the humerus has a round head that fits within this socket. The end of the scapula is called the acromion, and the joint between this part of the scapula and clavicle is called the acromio-clavicular joint, or AC joint. When this joint wears thin, it is called acromioclavicular (or AC) arthritis. Is This the Same as a Shoulder Arthritis? No. Doctors usually refer to glenohumeral arthritis as shoulder arthritis. As described above, the shoulder joint is located at the junction of three different bones: the clavicle, the scapula, and the humerus. In patients with AC arthritis, the junction of the clavicle and acromion wears thin. In glenohumeral arthritis, the humerus (arm bone), and its cartilage cover wear away at the socket of the shoulder joint. Not only are the injuries different in anatomic terms, but the implications for treatment, recovery, and complications are also different. AC arthritis is the result of repeated movements that wear away the cartilage surface found at the acromioclavicular joint. Because the shoulder is used so commonly, it is not surprising that after years of use the joint surface may wear thin. 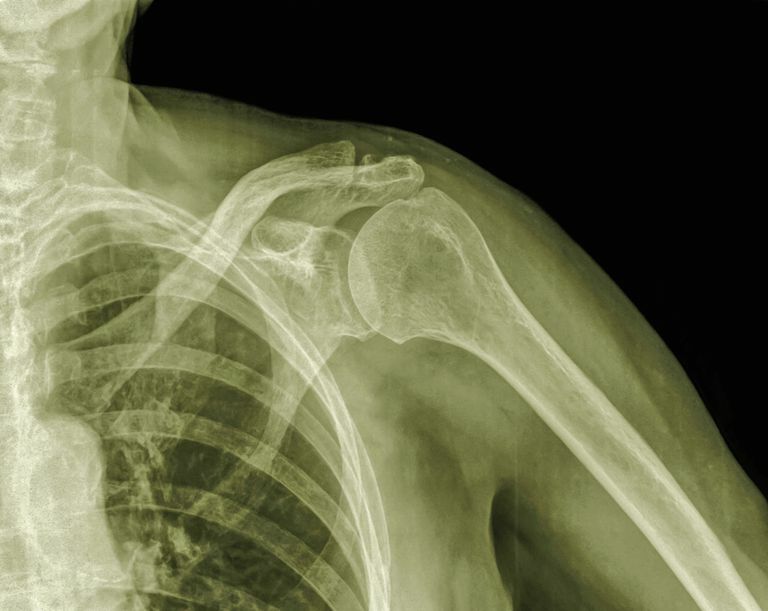 Injury, such as shoulder separation, is thought to contribute to the development of AC arthritis. Patients with AC arthritis usually complain of pain associated with shoulder motion. Specific movements exacerbate the symptoms. A common test performed by your doctor with be to bring the affected arm across your chest. This movement compresses the AC joint and will most often recreate the symptoms of pain. Your doctor may inject the AC joint with local anesthetic or steroids to see if your symptoms improve. Treatment of AC arthritis depends on the severity of symptoms and the presence of other shoulder problems including impingement syndrome and glenohumeral arthritis. If the symptoms of AC arthritis are mild to moderate, anti-inflammatory medications and physical therapy are the most common conservative measures. If the symptoms do not respond to conservative treatment, or if the pain is too severe, then surgery may be necessary. The surgical procedure involves removing the end of the clavicle (collarbone) and allowing the AC joint to fill with scar tissue. This allows for normal movement of the AC joint (which is minimal even in normal shoulders) but removes the rubbing together of raw bone ends. The surgery may be performed through a small incision directly over the joint. It may also be done through an arthroscope by using small instruments to remove the end of the bone. Usually, less than one centimeter of bone is removed to alleviate the pain of the AC arthritis. Recovery times depend most importantly on other procedures (e.g. rotator cuff repair) that may be performed at the time of surgery. For an isolated AC joint resection, treatment usually lasts about 8 weeks and often involves working with a physical therapist.